Virtual Boss - Construction Scheduling Software- Quantum Software Solutions, Inc.
or service company you need the right scheduling software to stay on top of things. VirtualBoss is a fast and easy to use scheduling and job management software solution! Pocket VirtualBoss or Palm Virtualboss with your purchase! Click here for more info on Pocket VirtualBoss. Click here for more info on Palm VirtualBoss. Click here for more info on Remote VirtualBoss. If you want to find out what's new with VirtualBoss, go to our What's New page for important updates! If you’re looking for a scheduling and management package that can get you up and running in a day, VirtualBoss can easily meet that challenge. VirtualBoss is a job scheduling and task management software designed for home builders, general contractors, remodelers, tradespersons, developers, real estate property managers, and related businesses. Setup is a snap, and simplicity is the main feature. That means you can streamline your scheduling and job management functions without wasting time on arduous setup procedures and expensive training. VirtualBoss is here to streamline your scheduling and job management functions without wasting any time with setup or learning how to make it work. You could be up and running in less than an hour!!! Enter your typical schedule (or schedules) one time and from then on you can set up new jobs in just 3 clicks. It is that easy. If you change the completion date for one task, VirtualBoss will automatically update your entire schedule. With VirtualBoss, you can fax comprehensive work orders to everybody that has outstanding tasks in just 3 clicks. No other scheduling software makes it so easy to quickly update your entire schedule in only 1 step. VirtualBoss will keep your schedule and task list and provide the reports you need. 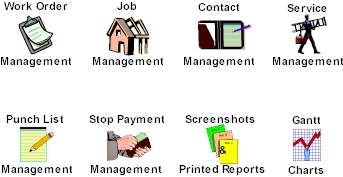 VirtualBoss also prints and/or faxes professional-looking work orders. All the VirtualBoss features revolve around the needs of professional contractors. It is easy to use, it's fast, and it gets the job done! VirtualBoss will schedule and keep track of your jobs. You will have a better idea of where things are out in the field, and you will be able to completely update your entire schedule by updating just 1 task. Your completion times will be reduced because of better planning, better communication, and increased thoroughness. Say goodbye to endless punch list tracking with legal pads. You can add additional tasks to any job in seconds. Punch list and to-do items will not be forgotten or fall through the cracks. And VirtualBoss can streamline your service like you would not believe. When somebody walks into your office, they will walk out with a complete list of every thing that needs to be done. VirtualBoss will make you look like a pro. It works great and will save you time. VirtualBoss will keep you ahead of your competition. VirtualBoss runs under Windows XP/Vista/7/8/10 -- and can be operated by multiple users simultaneously on a network. There is full integration with the Pocket PC via Pocket VirtualBoss. There is now also full integration with the Palm Pilot via Palm VirtualBoss. Streamline your scheduling and job management! Purchase with Quantum Project Manager & save an extra $30! If you would like more information or have any questions, let us know with the form below.